As a financial advisor, are you prepared for this transformational investment trend? 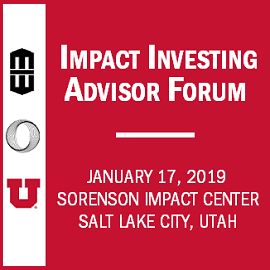 Join us on January 17 for a one-day workshop with Jim Sorenson, a global impact investing leader, and other professionals from the Sorenson Impact Center. Far from ivory-tower academics, the professionals at the Sorenson Impact Center are steeped in the real-world of impact investment. They run an impact investing fund and have extensive investing experience constructing innovative social finance instruments. the ways Financial Advisors are already successful and helping their clients. Ready to make an impact with your advisory practice? We hope you can join us at this unique event. Questions? Please contact MMI at (646) 868-8500 or events@mminst.org. The essentials you need to successfully discuss impact investing with your clients, including a brief overview of the history of impact investing and an introduction to key vocabulary and terms. HOW REAL IS THE IMPACT INVESTING PHENOMENON AND WHAT ARE THE PROS AND CONS? A deeper look at some of the myths and realities of impact investing, including data on the size of the current and prospective marketplace, and the reasons why impact investing could be a good or bad fit for particular clients. While setting standards in investments to ensure they have a positive effect is a crucial first step, investor engagement with investee companies and their industries, as well as with other corporate stakeholders provides a means of multiplying impact. Investors can use their voice for change in the capital markets, letting companies, investors and policymakers know that our shareholders are seeking more from their investments through direct dialogue with companies, the filing of shareholder proposals, the principled use of proxy voting, and speaking out on public policy issues. A panel of successful private wealth Professionals discuss why and how they have engaged with clients around the topic of impact investing. Mr. Sorenson is a globally recognized leader of the impact investing movement. He provided the David Eccles School of Business at the University of Utah a $13 million gift in 2013 to create the Sorenson Impact Center, with a mission to cultivate students’ social impact expertise. He plays an active role in supporting the Center and mentoring its student participants. After leading a team that developed a high-quality, low-cost videophone that transformed communication capabilities for 1,000,000 deaf individuals in the early 2000s, Mr. Sorenson realized that his investments could ‘do well while doing good,’ and he hasn’t looked back. A more in-depth discussion about the types of solutions and investments available and where advisors can find more resources to better inform themselves and their clients about impact investing. Topics include ESG, direct investing and managed funds, and popular, respected sources of information. A summary of the Forum’s sessions and topics, time for questions and answers, and a discussion about the next steps to success in impact investing. Align your firm with this high-profile initiative to educate Financial Advisors about impact investing and integrate it into their practices. You will build brand awareness and relationships with forward-thinking, growth-minded Financial Advisors focused on meeting client needs and positioning their businesses for the future. Review the available sponsorship opportunities here. Please contact Joan Lensing (jlensing@mminst.org or 646-868-8518) to inquire about sponsorship opportunities. CFP® professionals will be awarded 7 hours of CE credit, and Investments & Wealth Institute® has accepted the Impact Investing Advisor Forum for 7 hours of CE credit towards the CIMA®, CPWA®, CIMC®, and RMA℠ certifications. All cancellations are subject to a $50 cancellation fee. Full refunds minus the $50 cancellation fee will be granted for cancellation requests received prior to 5:00 PM ET on Monday, January 14, 2019. After that time, no refunds will be granted. Your registration can be transferred to another individual at your firm without penalty. To cancel or transfer your registration, please contact MMI at 646-868-8500.